*Note* Psychology, philosophy, economics, systems theory, etc. each have their own specific emphasis on the idea of trust. This outline loosely uses the social science lens, which deals with the position and role of trust in social systems such as a partnership between two persons, or the relational climate within or between organizations, communities and nations. In other words, how trust affects human social relationships. There’s no doubt that trust plays a crucial role in relationships. Trust, ranging from a completely broken trust to total trust is at the center of what defines social relationships. Businesses work hard to cultivate real and perceived trust. Their livelihood depends on trust, as do all relationships. Social relationships at all levels use the currency of trust to define the nature of relationships. 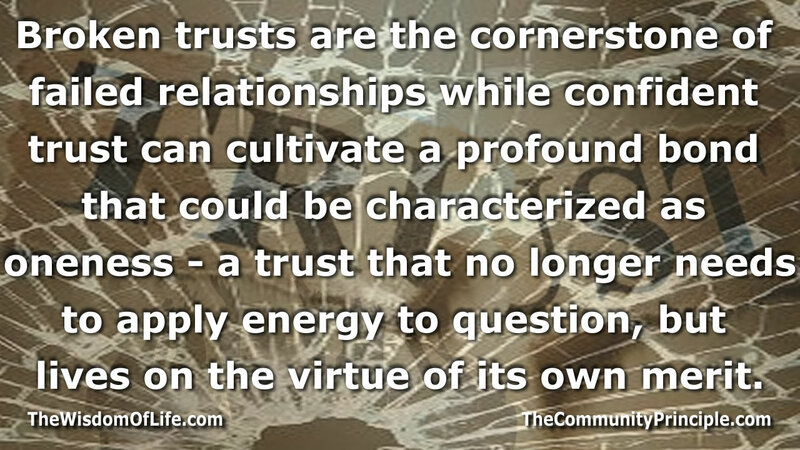 Broken trusts are the cornerstone of high stress, warring, avoidance, and failed relationships while confident trust can cultivate a profound depth in the relationship bond that could be characterized as oneness -a trust that no longer needs to apply energy to question, but is sustained on the virtue of each party looking for the others needs and actively seeking to meet them. It’s difficult to construct a accurate spectrum of trust for a number of reasons. One of these is the fact that there is a sender and a receiver as well as a perception and a reality in social settings. These do not always align. This confused mixture is a fertile ground for misplaced trust either toward too much or too little. Some are skilled at cultivating the appearance of trust or creating a sense of obligation to trust rather than the activities that produce a well founded reality that warrants trust. Depending on the effectiveness of the deceit, this false image can result in many a parasitic and predatory behavior that echoes long past the initial betrayal. We can develop suspicions due to past experiences that we project falsely into current or future situations. This can cause an inability to trust which in turn can cause other issues such as the pain of self inflicted social isolation. The bottom line, trust is a complicated climate that would take quite a bit of effort to unpack. This work only deals with a useful model of understanding in general how various levels of trust impacts relationships. This model uses four levels of trust to present a picture of the lowest to the highest form. They are as follows: Deterrence, Calculated, Knowledge based and identity trust. A Calculated Trust is based in projections and promises along with perhaps some facts such as reputation. It is a decision to engage in relationship based on a cost/benefit analysis, weighing the potential benefit of creating and sustaining the relationship against the projected cost. Generally, both parties are looking for some gain which the proposed partnership could yield, but deterrence is still a factor. If at any time if the cost is perceived as outweighing the benefit, the relationship is terminated. In this case, the party that perceives the harm must also be willing to follow through on severing otherwise the relationship shifts from trust to abuse. Engaging in a optional business relationship is an example of calculated trust. A partnership forged on mutual needs like the that found in danger situations, mountain climbing or certain critical business partnerships. Generally speaking calculated trust relationships can be fertile soil for higher trust in relationships to grow from. An Experience Based Trust can emerge out of calculation based trust once enough information from experience emerges. Predictability comes from a relationship over time. If that is seen to be of advantage, knowledge-based trust emerges. Control in the form of threats of deterrence diminish as more authentic trust bonds emerge. Less energy is applied to verification and more is applied to accelerating the potential that comes from sharing each others’ strengths. TIN is the range within the spectrum of trust relationships where the relational emphasis can shift from compliance to commitment. Both parties can begin to apply their full energies toward take advantage of each others strengths. This is where the full potential of emergent value can arise. (Where one party brings line, the other brings hooks ,so both can now fish.) Emergent values are those where the outcome is more than the sum of its parts. An Identification Based Trust happens when the relationship is fully committed – where both parties understand and fully endorse one another. Each acts as an agent for the others’ interests in a mutually beneficial symbiotic relationship. Identification Trust relationships are demonstrated by autonomous committed behaviors carried out by all parties. No one has to ask necessarily, each party inquires about the others needs and responds by actively seeking to meet them. The relationship is no longer based on promises, it is a fully realized intimacy. At this stage, if one party is hurt, the other feels the pain. Secrets evaporate in this climate because they are no longer necessary as a means of protection. The boundaries between the parties disappear as all parties assume a common identity. Co-location, joint development of products and services, shared vision, values, goals and the like are possible in this high trust climate. Compliance based on elements of deterrence disappear and full commitment defines the relationship. The lowest form of trust is deterrence. Relationships based on deterrence are motivated by the fear of punishment for non compliance. Next up is relationships based on calculation. These use a cost-benefit analysis with a deterrence factor where the relationship will break down if the benefit is not realized. Next is relationships based on knowledge. These emerge from a calculated relationship once enough information from experience emerges. Knowledge is where the relational emphasis can shift from compliance to commitment. Both parties can begin to apply their full energies toward take advantage of each others strengths. Relationships based on identification happens when the relationship is fully committed – where both parties act as agents for the others’ interests. No one has to ask, each party is interested in the others needs and actively seeks to meet them. What are your relationships based on? Do you think you have a realistic view of the trust you should place? Are you authentic? How does integrity play in a field where there are well skilled posers? What do you think we can do to improve the climate of trust? What impact do you think this would this have on the world?